The gradebook in Scholar is not designed to allow for grades on a 4-point scale. I prefer the 4-point scale however because it’s clearer and more exact. 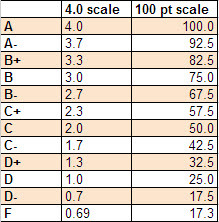 To solve the problem, I am entering your grades for the project assignments using the following scale.